A little about the breed……. Wolfhounds are a wonderful breed, I can’t imagine living without them, but they are not a breed for everyone and it is essential that you do your research properly before venturing to buy a Wolfhound. The’ Gentle Giants’ adage is largely true and they are wonderful family companions. But at the heart of it they are still the sighthound they were intended to be. So as a first time owner, you need to be aware of the general characteristics. They may chase anything that runs away from them. They may kill sheep and chickens; odd hounds might be OK in this respect but always work on the basis that they chase. They grow very big. 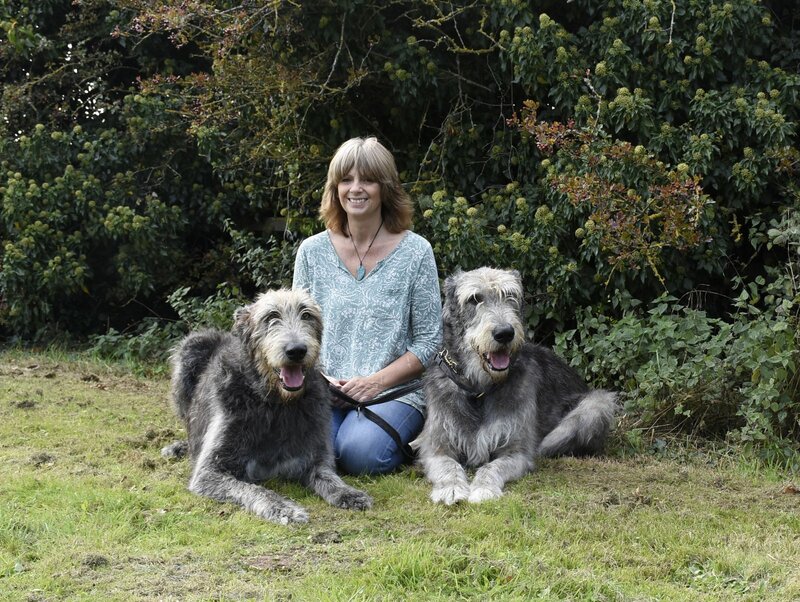 I never cease to be amazed when people who have already bought a Wolfhound say they didn’t realise the dog would ….grow this big ….be so boisterous….eat so much…. It really is a case of having to do your research first. However much you want a Wolfhound you must consider the environment you can offer it, they need a well fenced garden area, they need access to ground where they can run, they need not to be left alone all day, they need a home where their size can be accommodated and owners that understand this sensitive giant sighthound. When their ‘childhood’ is over, they are the most easy going relaxed hounds to have around. Wolfhounds are a long boned breed and as such puppies need very careful rearing to prevent damage while growing. When owning one of these giant breeds you need to take out insurance against veterinary costs, which can be extremely high, and insurance can cost anything from £35 per month upwards depending on the policy. Look for lifetime cover policies and elect for as high an amount per condition as you can afford on the policy, these can be sourced using comparison websites such as gocompare.com. I am a very nervous and anxious person. I was prescribed Xanax by a neurologist and was to take it in case of force majeure. The action is very soft, I feel relief, the problems go by the wayside, the drug enlightens mind. If you don’t have anxiety and other things, you won’t feel any effect. Nevertheless, there are serious disadvantages. It noticeably deteriorates memory, sometimes it is not possible to remember what you have done a minute ago. It is a kind of amnesia. At 6 months a Wolfhound puppy will weigh in the region of 100lb, but will still have the playfulness of a puppy like any other breed; imagine having a toddler around you – it’s much the same. They need human companionship. DO NOT buy a wolfhound puppy and then leave it all day while you go out to work, it is nothing short of cruel. If you intend to have a kennel and run in the garden – not our ideal situation, but if you do then never kennel a Wolfhound alone. For a dog this size crating IS NOT AN OPTION – if you need to do this in order to go to work, then don’t get a dog. Because they are big, it doesn’t mean they need to live outside – quite the opposite, they seek the company of people and are best suited to a home environment. Anyone with a Wolfhound can use the Breed Heart Testing Scheme. Our biggest enemy in any long boned breed is cancer. If we want to improve the longevity of our breed it is important that we contribute to these http://premier-pharmacy.com/product-category/womans-health/ projects when we can. Information on how you can contribute to any of these projects can be found on the Health Group Website. The IW Health Group is collecting information on the incidence of Livershunt in Wolfhounds here in the UK, therefore are collecting information from clear and affected litters and cheek swabs for DNA research into the cause of the condition. Puppies are available very occasionally to carefully vetted homes. Contact us by EMAIL for details of litters due. Before you think of having a Wolfhound – do your research. The Magnificent Irish Wolfhound, written by Mary McBryde is about the best book you can get on this subject.